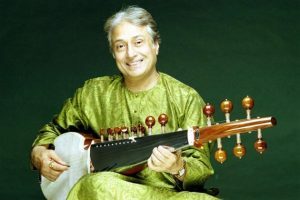 Sarod maestro Amjad Ali Khan, who has enthralled audiences all across the globe with his mellifluous music, is concerned that people are today more interested in fusion than pure classical music. “Today people are more interested to see collaborations. Why are people more interested in fusion, what is the reason and why is it happening? It is a very big question and it bothers me,” Amjad Ali Khan told IANS in an interview on the sidelines of the World Sacred Spirit Festival (WSSF) here. “Why are people losing interest in pure classical music? It is not only a problem in India but also of the whole world right now as they want to see more collaborations,” added the veteran artiste, who has performed around the world. Amjad Ali Khan and his sons Amaan and Ayaan mesmerised the audience with their soulful performance at the recently concluded WSSF, which saw a confluence of global musical exponents showcasing traditions from the Orient, the East and Africa. Talking about fusion, he revealed that his sons – who just last month performed in Delhi with Grammy nominated violinist Elmira Darvarova — often decline to play such collaborative shows. “Even my sons are invited for fusion shows but they respectfully decline saying that they would perform only if people would want to listen to the sarod,” said the father, who has impressed music aficionados for years altogether with innovation of complex ragas. The 70-year-old musician, who has performed internationally for over four decades, doesn’t want to blame the audience if they are not able to connect with the instrument. “If my sarod doesn’t affect the audience, then it is a minus point, an issue in me and not in the audience. The classes and masses classification has got nothing to do with the art. It is very easy to say that audience is bad, but I would say that you don’t know your art then,” asserted the Padma Vibhushan awardee. He also lamented that despite adapting “so much from the British”, India hasn’t been able to “produce a symphony orchestra like theirs on both national and international levels”. “Now there is however a little awareness and small orchestra groups are coming up in Chennai and Mumbai, but the sad part is that they all get musicians from outside,” Amjad Ali added.